A few weeks ago, we had a blast giving students from Lucerne Elementary Secondary School in New Denver, BC a sneak peek of the Sense of Place exhibition at the ArtStarts Gallery. 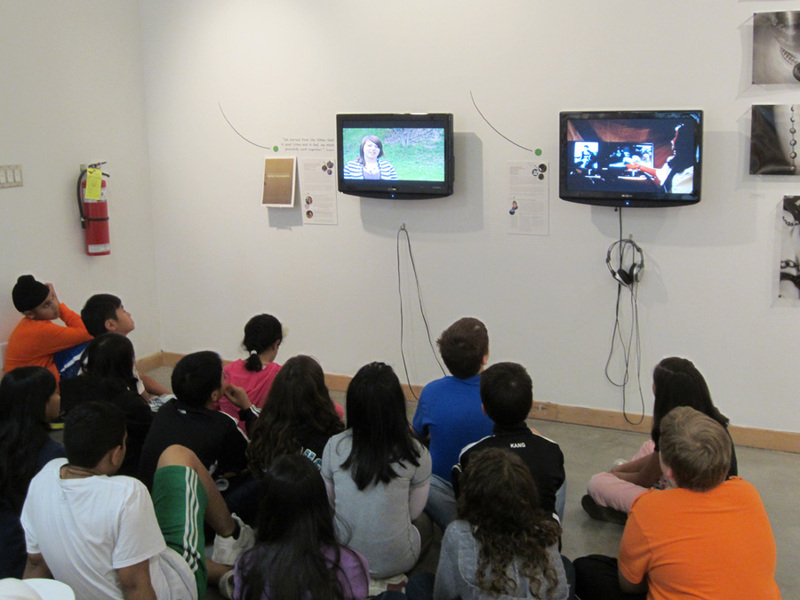 The students were in town for a few days to visit Vancouver, and we were happy that ArtStarts was be one of the places they stopped on their trip. 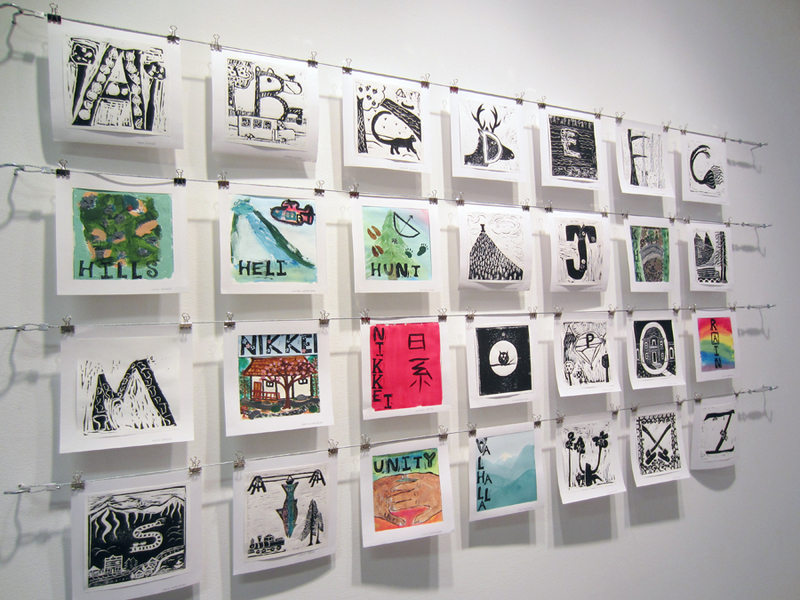 Some of the students had taken part in two of the projects on display in Sense of Place: Telling the Stories of the Nikkei, a documentary filmmaking project undertaken by Lucerne Elementary Secondary School in New Denver, BC along with artists Moira Simpson and Catrina Megumi Longmuir; and The ABCs of Community, a printmaking project that students from Arrow Lakes Distributed Learning School in Nakusp, BC worked on with artist Morgen Bardati. During the students' visit to the gallery, we were treated to some of inside stories behind the artwork, like the one about the Grade 3 student who was so inspired by her new printmaking skills that she made more on her own time and then sold them at a local farmers' market over the summer! 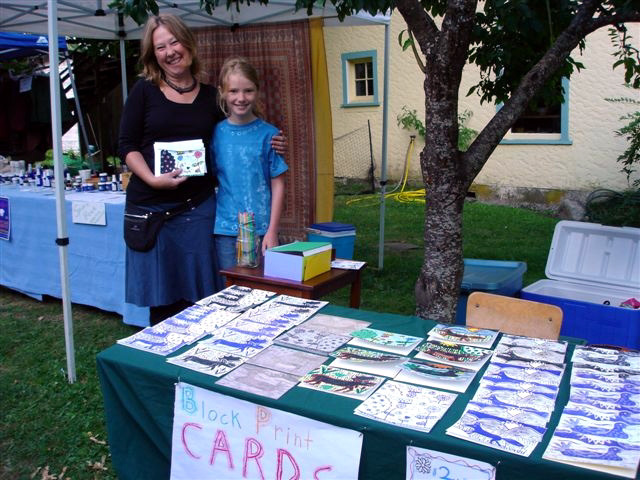 Today we received a lovely photo from that student, Shanna, accompanied by artist Morgen Bardati, proudly displaying her artwork for sale at the market. Amazing work, Shanna! What's more, after they returned home from their trip to Vancouver, the students from New Denver wrote an article for their local paper, The Valley Voice, about their visit and their involvement in the Sense of Place exhibition. Click the image below to read a larger version of the article. Thank you to Lucerne Elementary Secondary School for a great visit, and for inspiring us with your creativity and initative!